Dedicated to providing you with the most reliable and cost-effective equipment available, Graco offers a complete line of Grease and oil pumps, hose reels, dispense valves and accessories. Our packaged solutions deliver the highest quality results in all areas of manufacturing; including marine, automotive assembly, truck, construction, mining and machine tool markets. Installation expertise is available through an experienced and dedicated sales force. Graco manufactures a wide range of meters that are ideal for in plant production and maintenance applications where rigorous daily routines demand rugged, accurate dispensing of fluids. The right reel is essential for maximizing pump and meter efficiency. That's why we put the same level of craftsmanship into our hose reels as we do in our other lubrication equipment. 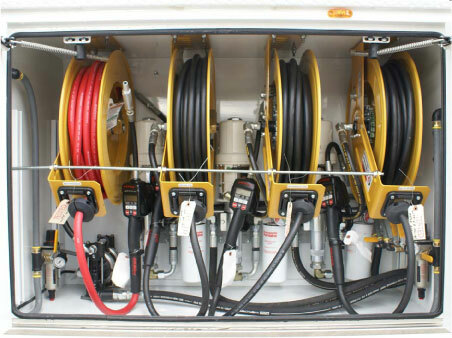 We offer a wide range of hose reels capable of handling lubricant oils, grease, air/water, windshield wash or anti-freeze. For over 25 years Graco has recommended hydraulic pumps as a more efficient power source. Hydraulics are cleaner to operate while air supply systems can develop rust scale and contaminants from condensed moisture - potentially damaging the pump. The Dyna-Star™ and the Power-Star hydraulic Operated lubricant pumps are perfect for bulk lubricant transfer. Choose from wall, tank or bung mount systems.